THIS PAGE IS GRAPHIC INTENSIVE. PLEASE BE PATIENT AS IT DOWNLOADS! Here's a few of the Newspaper articles that have been written about my work. 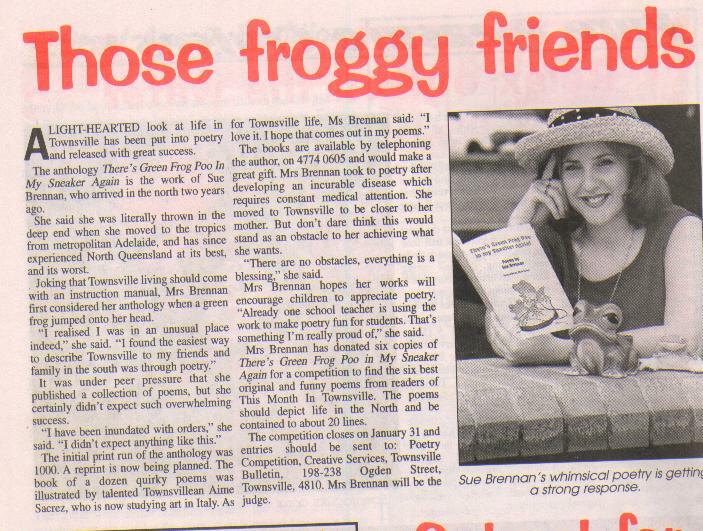 My big break came when I was put on the front cover of the Townsville Magazine. You may notice that Larry got in on this picture. This article was a full page story in the weekender and gave me lots of great PR! I was very fortunate in Townsville with all the interest shown to my work. 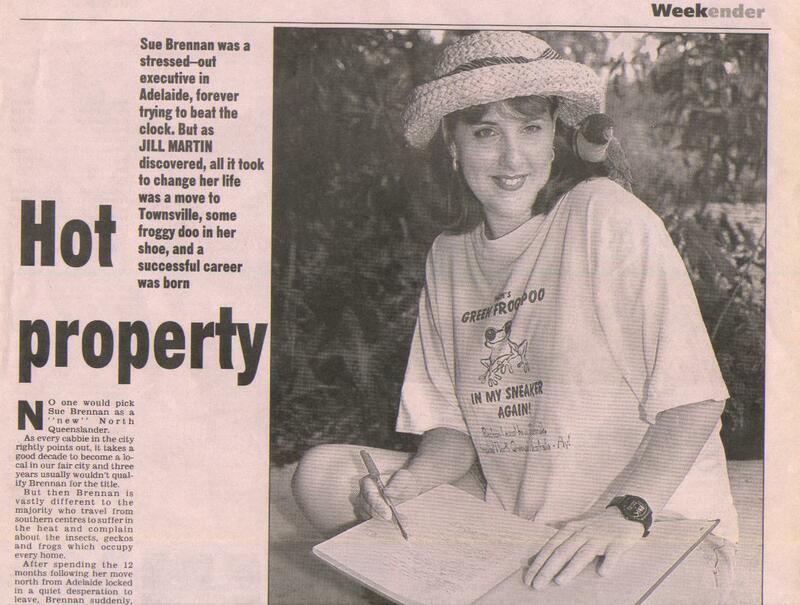 I was invited to take part in many radio interviews, including the ABC and as I was a Breakfast show announcer myself, I had lot's of opportunity to recite on air! One of the greatest joys of my career, was when I was asked to recite for a group of 2000 people ( I was pretty nervous I can tell you). The Motorhome Association of Australia converged on Townsville and filled up the entire Townsville Showgrounds. There were motorhomes everywhere you looked. I was approached and asked if I would like to run some Poetry Breakfasts for them and I agreed. IT WAS A RIOT! I played the role of hostess and each morning and I was joined by lots of great people from all walks of life up on stage. Some of the poetry they recited was so funny, I had tears rolling down my face. Definitely one of the greatest times of my life. 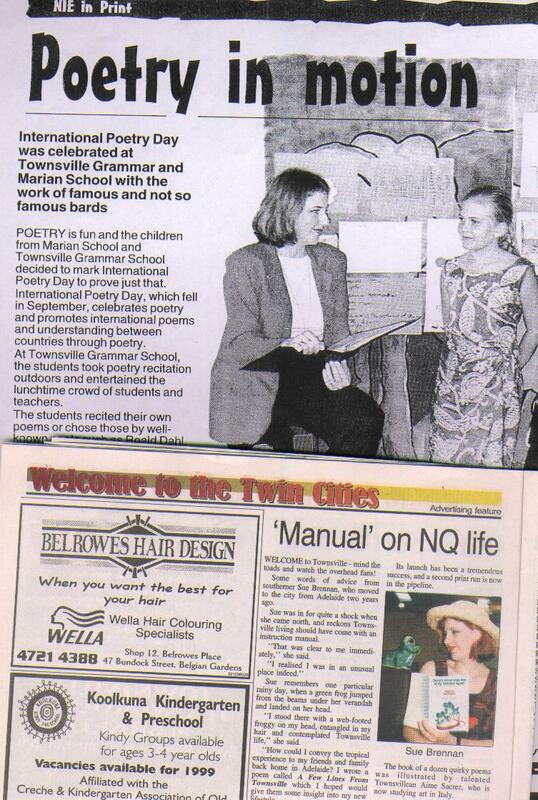 Whilst living in Townsville, I recited for numerous groups and organisations. I can hardly remember a time when I didn't have a microphone in my hand. 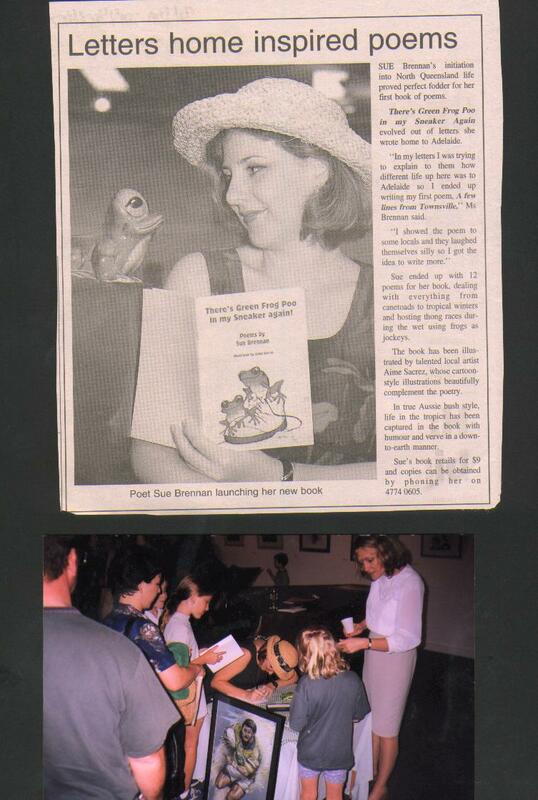 This included schools, retirement homes, business groups, at Bush Poetry fairs, for cultural associations, in shopping centres, in malls, on centre stage and even on TV. My performances were always free. How can you accept money for doing something you love so much? My poetry gave me the chance to meet lots of wonderful people of all ages. It opened many doors for me. It was a fabulous time in my life. This is actually just a few of the articles. I don't dare put any more on or this will take forever to load. I hope you found them interesting. Who would have thought it? 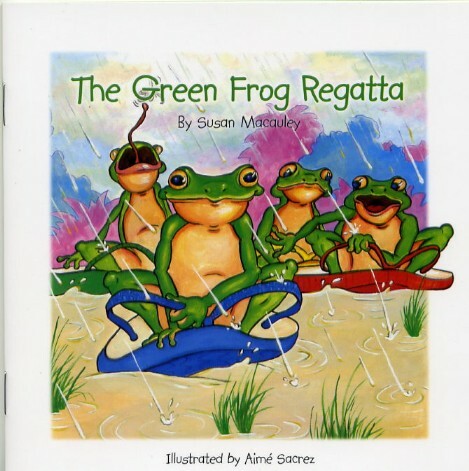 instant fame because of "Green Frog Poo"!